Since December 2012, Lanzhou High-tech Zone, under the policy guidance“Integral Development of the Three Districts”adopted by the Lanzhou municipal party committee and government, has built the construction headquarters that will be responsible for the business investment attraction and project services. At the same time, construction headquarters of the Eastern New Town of Science and Technology, located at the Lanzhou High-tech Zone, have also been established and are in charge of affairs related to investment attraction and land requisition and demolition. The rapid economic development of the Lanzhou High-tech Zone is closely associated with the successful operation of Lanzhou Investment and Trade Fair in 2013, where many investment projects were signed. Specifically, 12 agreements have been signed at the provincial-level exhibitions, with the amount of contracts totaling more than 7.29 billion yuan (about US$1.17 billion). At the end of May 2014, 2.813 billion yuan have been allocated. It is estimated that more than 40 percent investment will be allocated by the end of June. The targeted amount of investment is 11 billion yuan in 2014, with 5 billion yuan of the Eastern Town of Science and Technology and 6 billion yuan of Industrial Park, respectively. 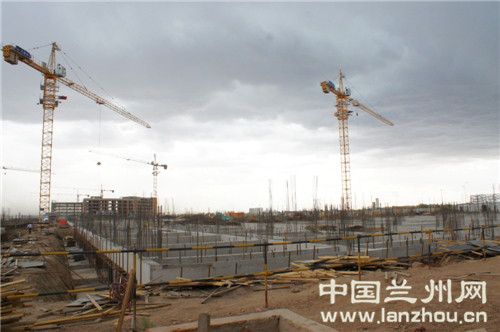 Now, 12 important construction projects have been underway in the Lanzhou High-tech Zone. Companies and government departments have an effective and timely communication channel. Any problems that may emerge during the process of project implementation can be immediately solved. Lanzhou High-tech Zone is trying to push forward its local economic growth and build a positive image.